In China, the ratio of 3G mobile user is still less than 20%. According to the report by MIIT, the latest number of mobile user in China was 1062.028 million people, and among them 3G mobile user was 183.761 people. And the net increase of mobile users in China was 75.775 million people from January to July. Among them, the net increase of 3G users was 55.338 million people at the same period of time, and the ratio of 3G users net increase was 73.1%. The ratio of 3G mobile users were still less than 20% at the moment, but the growth rate of 3G users were larger than whole mobile user's, so it can be said that 3G users is surely increasing(Though its speed is a little bit slow...). And the diagram below is the ranking of whole mobile user number by individual region. 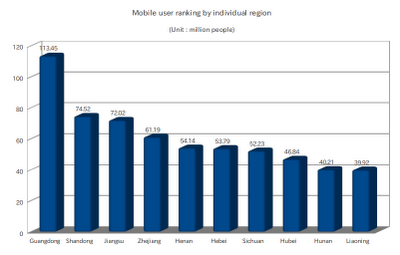 Guangdong is the largest region of mobile user number, and there are 113.45 million users. Let's keep attentions to their action as ever.